When I first saw the parcel, I didn't realise it was the jilbab as it was quite thin and light. When opened, I realised the colour is actually a little lighter (and nicer!) than what you can see in the pictures on their website, and has a cooler, more grey tone. I also found the jilbab needs a fair bit of ironing before you can wear it. Now initially I had to exchange the jilbab because of a problem with the sizing. The size chart on the website does not list measurements (except for height) only that the S/M/L sizes correspond to certain UK dress sizes. Now as for most of us, I tend to buy a size larger when shopping on the high street to ensure a looser fit. Now even taking this into account, I found that the IDH sizing was far too small. This was a little disappointing; realistically, the Large jilbab which is supposedly for sizes 16-18, would only really fit a UK true size 14, so I would definitely like to see a wider range and more accurate sizing system. Regards the length, I also found the jilbab is only barely wearable with completely flat shoes, so I'd recommend purchasing a longer length than you think you'll need and then then hemming it up to adjust it. The jilbab is made from 100% cotton so is lightweight and comfortable for summer, but would also be suitable to wear in colder months as the colour is fairly neutral. It's also quite easy to move in, and has the added bonus of two front pockets. In terms of the design itself, it is of course a casual jilbab, but to make it more versatile, I would actually have preferred a simpler garment with fewer of the "urban" detailings like the stitching which goes all around the jilbab, as well as the logo at the back. Overall, this is a great jilbab for casual, everyday wear; especially if you prefer something different to the usual black. It's also easy to pair with different coloured scarves and accessories, but just watch out for the sizing. Have you ordered from IDH before? What did you think of their products? Disclaimer: I received this jilbab in exchange for my honest review. The opinions and thoughts expressed are my own and I received no other compensation for my review. Earlier this year I bought this Silk Route abaya; http://essenceofcapetown.co.za/archives/466. Overall, I was quite happy with my purchase. I generally order my abayas a little longer to wear with heels or for it to be long enough to cover my feet while making Salaah. This one was the exact length for my height, instead of being too long, so I agree it would be best to order a little longer. Some of them have a trim or detail at the bottom so there might be an issue with shortening it in that case. Other than that, I was happy with the fabric and fit and really like the casual feel of the particular style I ordered. I ordered a jersey fabric jilbab from silk route a couple of years ago. When I first received it - I loved it; however, the jersey fabric shrunk a great deal after a wash or two and I was really disapointed because it was quite comfortable. I bought one two years ago, a similar one with a zip and combat pockets in black, my mum bought it for me it was quite expansive for what it was £35 was actually £40 got a discount... the size was weird it rolls up when walking which is very annoying and and it needs major ioning! 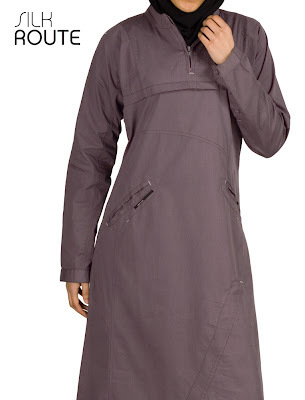 not exactly what you want for a casual sports abaya which should be versatile and moveable. I think that the quality of their abayas are good, but I am not so found of the models and think that they should get bigger sizes so I am please to hear that they are changing their sizes. I prefer black abayas without many details.Or with some details and good quality and I have one favourite shop to buy from on the internet that offer this for me.Alhamdulillah that there are many shops to choose from. I recently purchased 4 different abayahs from Silk Route and masha'Allah I was very happy with my purchase. I like them for the first time I found abayahs that fit me perfectly, I'm tall and quite slim and I found most abayahs made me look big, I know the hijab is not meant to show your shape and such but I felt that abayahs always made me seem big or make me seem shorter which I didn't like so alhamduillah I have found my saviour! Silk Route! Pricey but worth it alhamduillah. Sister Jana, I just wanted to ask if you had some other access to the pictures you do, you know the hijab styles. I saw on a friend of mine, her facebook, that the pictures were all there, however for people like me (no facebook! :$) is there a way I can get to all the hijab styles?? Shukran, and of course, mash'Allah lovely blog as always. Nida - are you the sister with the "in the shade of Islam" blog? what happened to it??? Do you have photos of the jilbab you got? I always like to see customer photos of a purchase, cuz sometimes the website photos are waaay different. Thanks! Anon, I'm not sure which 'hijab styles' you mean? There's nothing on the FB page that isn't taken from the blog. us sis, I haven't been able to take photos, but actually the images on the website are pretty accurate!